Adobe Photoshop Elements may well be one of the most capable and popular choices when it comes to image management and editing on the PC next to its big brother, Photoshop. The latter is the tool of choice for professional designers, photographers and anybody looking for a powerful image editing application. Elements is the quite capable younger brother for users who don't want to shell out big bucks but are still looking for high-performance software. The Photoshop Elements application serves two major purposes: photo editing and organizing your images. The organization capabilities of Elements 10 is one of the best in its class and borrows heavily from professional offerings from Adobe, like Lightroom, and is easily more capable than the Bridge application that ships along with Adobe Photoshop. Once you select the Organize option on the Elements 10 start-up screen, you are treated to the familiar image library interface as in the previous version of the software. The interface is so similar to version 9 that users upgrading from the earlier version will not see much of a difference. 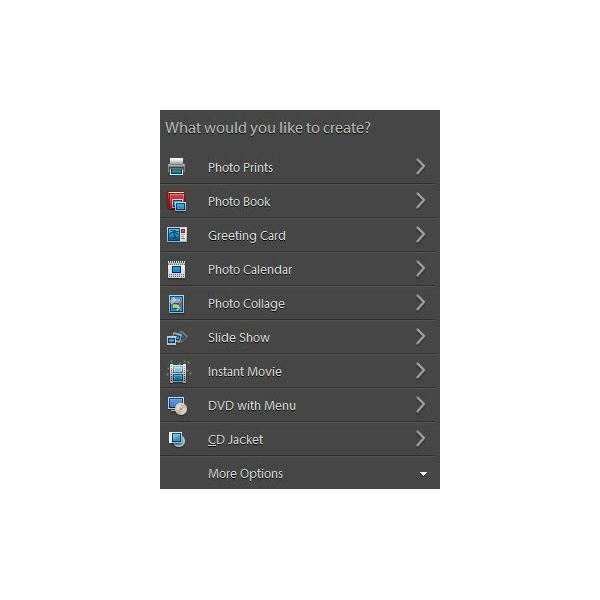 There is an easy-to-use and self-explanatory organize panel to the right, where Albums, Smart Albums and more can be created. Additional keyword and people tagging options are provided on the lower right of the screen. Images can be viewed as thumbnails with other view options displayed in the toolbar above. Images can be imported with the import options available in the File menu, import can be performed from the camera directly or through a memory card. Images can be rated, tagged and arranged in albums. The auto-tagging of images allows for better organization and is a feature that I personally like. All in all, the organizational part of Elements 10 is well-rounded for consumer use and quite capable as well. Image stacks are an efficient way of organizing similar images. We generally create copies of the original file that we modify and soon are lost in a flood of similar looking images. This kind of organization can quickly get out of hand creating a "needle in a hay stack" problem. Stacks help keep similar images or modified copies of a single image within one collection, which can then be called up or "unstacked" just by clicking on the stack's topmost image. 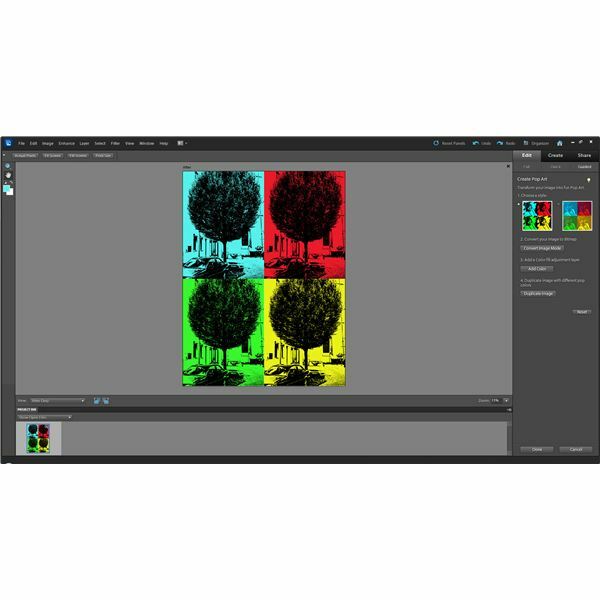 Photoshop Elements also maintains the different versions of the image so you don't have to go through fifty different variations that you made before you get to that single image. Additionally, you can always tag your modified images to make it much easier to locate and share. A stack can contain multiple versions of an image or multiple images themselves, this is denoted by a black arrow on the right (marked in screenshot) and clicking this arrow opens up the stack to view all the images within. One of the new features added to the current version of Photoshop Elements is "visual search." This feature allows for locating images that contain a specific item or object. As shown in the screenshot above, I did a search to find blue shoes in my album. The search picked up the two instances where the blue shoes were but also brought up several unrelated images. The search can be further tailored by using the color-shape slider which makes the search more sensitive to color or shape, thereby making the results more accurate. This is indeed a very nifty addition to Elements 10 and does make it somewhat easier to locate images. That being said, the search feature itself is not very good but is decent enough. You will likely always have unrelated images in the results, but it does help in narrowing down the number of images that one has to go through before finding the image they're looking for. I'm guessing the next version of Elements may improve the reliability of the search tool making it more effective. Sharing photos online is great, but how do you make your images stand out from the rest? You've seen all the special effects that some advertisements use or even how some photographers make those slick borders that just add that special look to their images – now you can add the same to your images! My favorite is the pop-art effect which used to take several series of steps in Photoshop or involve running a complex action. The Photo Stack effect shown above is just one of the cool ways of presenting your photos online, All this can be done without knowing the software inside and out because it takes care of the all the underlying work, making it very user-friendly. Though not very helpful from a photography perspective, adding and manipulating text on an image makes for interesting greeting cards, calendars and more. If you are familiar with any kind of desktop publishing software, you know how geeky text placement can get, now Elements 10 makes that job very easy. Placing flowing text over shapes or custom lines in your images is simple and easy. Greeting cards and photo books can now have more impressive text design thanks to new text placement controls. Shown in the screenshot above is a test where I've placed text just over the white circle and the text easily flows along the shape. This is just one example of what's possible, there are so many options on what you can do with text within an image. One of the most powerful features of Photoshop is its capability of making smart selections and applying effects to selective regions of any given image. Now this same power is in the hands of Photoshop Elements users with the help of the smart brush, which only modifies selective parts of an image. Photoshop Elements 10 now includes 30 additional presets for use with the smart brush, which means more fun with selective coloring, painting and more. The smart brush is a combination of selection and enhancement controls in one tool – choose the effect you want to be applied to a specific part of the image and go to work by just painting them over, that's it! A simple and effective tool when used for enhancing contrast and color selectively. As I mentioned previously, Adobe has constantly been adding features that were once only available in professional-level apps. The Depth of Field tool now available in Elements 10 allows users to make their images interesting by adding a shallow depth of field. Some images, especially portraits, often have a blur around the subject providing isolation and sharpness to the central focal point. Now, this kind of look can be applied via Photoshop Elements 10 to any image using the Depth of Field tool. By selecting the central subject in your image, the remaining parts of the frame can be blurred creating more appealing photographs. In the screenshot above, I've used the tool to generate a mild but visible blur around the central subject. Making collage posters is one of my favorite ways to display photos, and if you're into creating custom posters, you'll love what this program can do. Generating such collages manually requires extensive work in Photoshop or it can also be performed with pre-designed Photoshop actions. However, Elements provides the easiest method ever – simply drag and drop images and you've got your collage ready. There is always the possibility of customizing the image alignment according to your tastes, and you'll have much more control over how the collage looks. Though not everybody may find use for this feature, it is fun to play with. Sharing your images with friends or family at home, on your computer, projector or your widescreen HDTV is exciting. Elements 10 allows you to create captivating slideshows with your images. You can have fun adding additional clip art and stamps to your images and you can even embed audio to make it more interesting. If you're showing off a field trip, for example, you can record your own audio narration along with it and make presentations just like professional photographers do. Having the ability to create things like photo books and greeting cards is a standard feature in Photoshop Elements and version 10 brings some improvement to the already solid tools available. Elements 10 offers a user ways of making snazzy photo books with new layouts, greeting cards which now have newer ways of placing text and standard calendar templates. Elements 10 provides a few new templates and text editing possibilities that are new, but nothing remarkably different from the previous version. Tagging people in photos make it easier to look up images when your catalog runs into hundreds or may be even thousands of images. Memory cards for modern digital cameras are getting cheaper and cheaper, helping us capture more moments than we used to. The downside of cheaper memory is that we tend to accumulate a lot of images, which can become too much to handle! Now with Facebook support, tagging people in your photographs is easier than ever. You can now search for photographs based on the people or faces in them. Tagging people in your photos managed by Elements 10 requires you to enable authorization of your Facebook account. I should mention that rising privacy issues with people tagging in Facebook could result in this feature not being as useful as you hope for, depending on the privacy settings that a Facebook users chooses. Adobe has once again made a wonderful product in Adobe Photoshop Elements 10. The current version is definitely worth its price with all the capabilities that it provides. Given that Adobe often provides exciting offers on pricing, Elements 10 makes a great buy for the average photo enthusiast looking to purchase his or her first photo management and editing application. If you already own version 9, I would suggest skipping an upgrade and wait for the next version to be released. You can always take a look at our Photoshop Elements 9 review and see if the most recent version offers value as an upgrade.